Ovda Regio. Magellan radar image. Ovda Regio is one of the large highland regions ringing the equator of Venus. Ova Regio consists largely of low-relief, rounded linear ridges. These ridges, 8–15 kilometers (5–9 miles) wide and 30–60 kilometers (20–40 miles) long, lie mostly along a 100–200 kilometers (60–120 miles) wide slope where the elevation drops 3 kilometers (2 miles) from Ovda Regio to the surrounding plains. Some of the ridges have been cut at right angles by extension fractures. 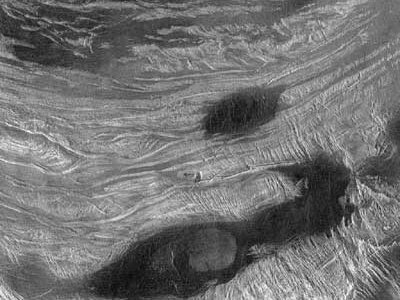 Dark material, either lava or windblown dirt, fills the region between the ridges. The curvilinear, banded nature of these ridges suggests that crustal shortening, roughly oriented north-south, is largely responsible for their formation. Such crustal shortening was unexpected by Magellan scientists, who believed that Ovda Region, a likely site of hot upwelling from the interior of Venus, should be dominated by volcanism and crustal extension. This radar image shown here is centered approximately at 1° N, 81° E, measures 300 kilometers (190 miles) by 225 kilometers (140 miles), and was acquired by Magellan in November 1990.